Our impression of Singapore is that it's entirely concrete, organized, monotone and restrained, sophisticated and snobbish, and that it's one huge overly planned city pretending to be a garden. In most areas, it is but you'll be surprised that the world's most expensive city has space for artists and independent retailers. You might think that your SGD30 (roughly PHP975) will not buy you a dress in fancy Singapore. 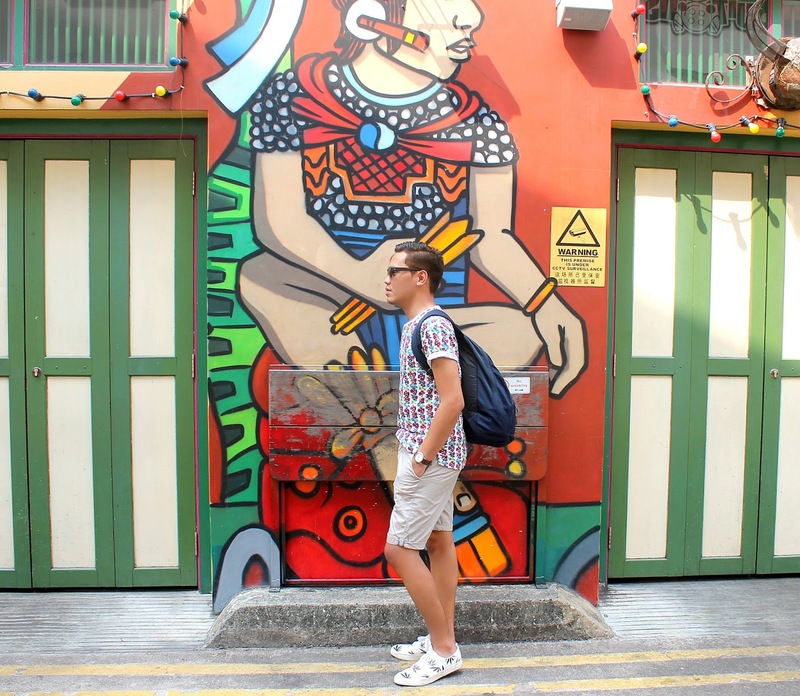 In a tiny colorful strip called Haji Lane, a shopper can take a break from the luxurious brands being displayed in almost all malls in the Lion City. Yes, cheap but beautiful clothes can be bought here. We we're just supposed to stroll along Haji and maybe grab some good food but I guess, we enjoyed shopping more. I found HDLN Men's Apparel which was one of the few shops open for shoppers that early morning. That's where I found this colorful top that I'm wearing in the pictures. I got it for only SGD23 after a 20% mark down. In Singapore, that's already a good price! I felt it was perfect for my Forever 21 khaki shorts and white sneakers. With this great find, I thought an OOTD shoot was appropriate. The place has to be explored more by a female shopper. From cashmere scarves to accessories, summer skirts to Sunday dresses, even evening gowns are being sold in boutiques along the lane. They are standing side by side with cafes and pastry shops so it wouldn't be a problem if you spent several hours shopping. A quick bite is very accessible!